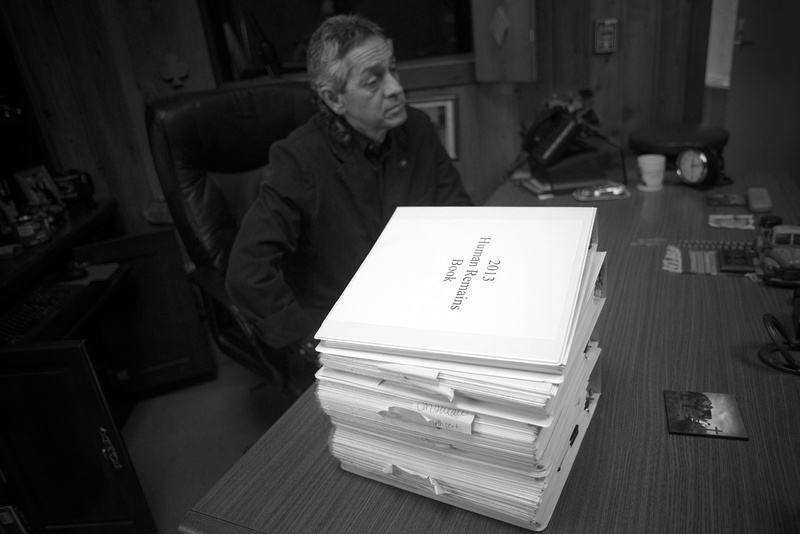 FALFURRIAS, TX - FEBRUARY 26: Brooks County Sheriff's Department Chief Deputy Benny Martinez sits beside a stack of books that contain the files on the remains of the 127 immigrants discovered in Brooks County in 2012, in his office near Falfurrias, Texas, on Tuesday, February 26, 2013. The department has only four deputies charged with monitoring the 944 sq. miles of county land. An annual budget of roughly five-hundred thousand dollars keeps the Sheriff's Department from expanding the force which it says is sorely needed to keep up with the border issues facing the county.